The recovering perfectionist in me wants to tie this 31 day series in the most gorgeous grosgrain ribbon. Leave you dancing with a completed work of art, sparkles and moonshine in its wake. This has been quite the month — an utter joy to meet you here each day and a great emotional exhaustion to walk this unfolding mystery. It’s certainly been 31 days of recognizing the depth of my need and seeing the abundance of God. If you haven’t already read between the lines, for weeks I’ve counted down the days with Michael (without whom I could not have done this), friends and family and my girls. Only five more days until Mama won’t be too exhausted to function past 7:30 pm. Only two more days until I attack the junk around here and purge every last unnecessary thing from this house. Only one more day until I get a grip on our tardiness problem. Yes, things have certainly been a little out of whack-wackadoodle around here, and I’m ready — we’re all ready for a new season. One that involves more space for quiet, more sleeping in, more opportunity for filling that can spill out to others. I realize I didn’t choose a 31 day theme that allowed for much of the usual rhythms I rely upon, including time for shoring up between my spillages of vulnerability. In my real life, I’m all about sharing the real me, but I ask lots of questions about you, too, because I care about your journey, and I never want it to be all about me and my stuff. But this month, there’s been a whole lot of me as I’ve tried to share the reality of my right here — delight, boredom and tantrums included — in hopes that it all might be some kind of imperfect gift to you. Yesterday, as I considered what I might share today, I felt struck nearly hour by hour by the realities of this imperfect life and the choices I continually hold about how I am going to respond to my right here. I can see J braiding Lala’s hair for her Laura Ingalls costume as yet another thing I’m not doing, one more failing of a harried mother, or I can choose to see this as a gesture of love from one sister to another. An opportunity for J to grow in her skills and the kind of care that watches for baby hairs, an opportunity for Lala to receive tenderness from her sister. I can see our pulling up to school late — again! — as a source of embarrassment and shame or a reminder that this ol’ girl’s still got some growing to do, and I can still grow. I can see Michael leaving town this weekend just as I’m ready for some real rest as a cause of frustration that I won’t be able to “get what I need.” Or I can see it as an opportunity to learn a different kind of rest and offer that to my girls while we go about the activities of our weekend — just us four girls. And I can see the ever-deepening of my smile lines and “concern lines” (the ones that form a “V” between my eyebrows) as something to silently criticize and imagine erasing, or I can view them as evidence of a woman (and a face) living fully. We’ve got no shortage of opportunities to learn from right here when we show up and live fully awake — to take what is and examine it from different vantage points, asking the ultimate Perspective Giver for guidance, wisdom, grace. While we don’t know what’s around the corner, we do know what’s here. And only in being right here can we really ever be anywhere. 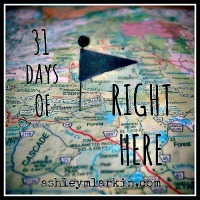 Say it with me now: This is Day 31 of Right Here! Throughout October, I’ve joined with a community of bloggers (linked up with The Nester) — all of whom wrote through the month about a topic of their choosing. To find all my posts in 31 Days of Right Here, click here, or see the listing below. 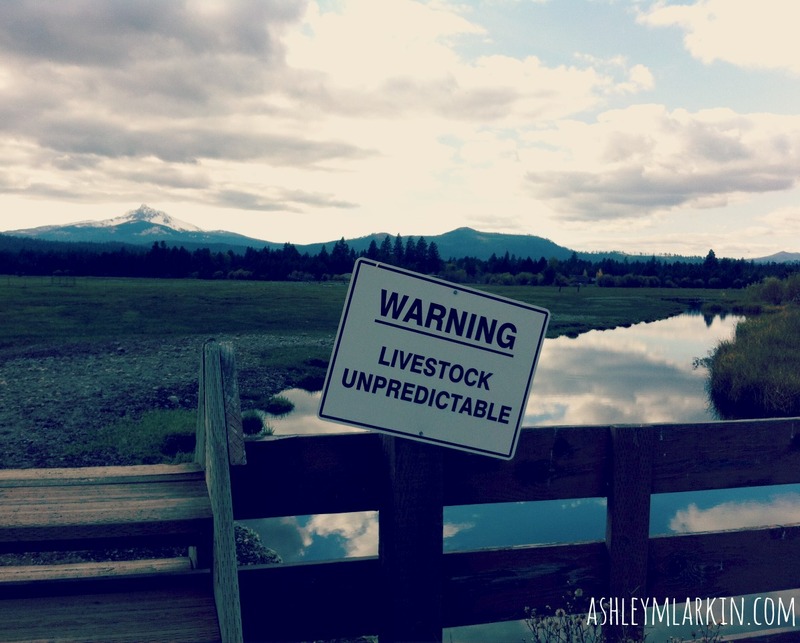 To continue receiving (a few times a week) words and images delivered to your inbox, subscribe to this blog on the sidebar at left, click here to Like Draw Near on Facebook or follow me on Twitter @AshleyMLarkin. IM DANCING SWEET SIS…. in my pajamas, in my kitchen as my children swirl around me in all our morning glory! LOL! So proud of you Sacred Writing Sister… YOU DID IT!!! Thank you, Sis! What a journey. I’m proud of you for taking on the same this month. You are rocking it! YAY! Congratulations on being done and on being poured out. Love your heart and your authenticity and the way you wrestle with your words. Thank you, Lori, for all your encouragement along the way. Maybe strange to say, but knowing you were there — choosing not to write, to be in silence and listen over the month of October — brought me great comfort. I appreciate you. The rest has been good, Mama. Thank you for all the ways you encouraged me to keep plugging along through the month of October. Bless you. I love you. Thank you for your presence here, Christy. I’m continually amazed by how much we all have in common with our sames yet differents. I appreciate being reminded of all of us living with so many of the same intentions and all needing a good rest! :-) I hope you have a replenishing weekend. My kiddos and I did have such a good time with my hubby away. We always miss him when he’s gone, but it was a great Girls Weekend. I pray you are finding spaces for rest yourself, Dea. Thinking of you often. It’s been a joy to meet you here, Angel. Thank you! Oh, dear me. You are beautiful, dear Ashley. Wrapping my arms around you, jumping up and down with you – CELEBRATING this final day of your wild, brave journey. Celebrating this very RIGHT HERE. You express rejoicing with those who rejoice and hurting with those who hurt so beautifully, Julia. I can’t wait to see you again and squeeze you in person. Well done, sister! I read your final post sitting here on my connecting flight in Denver. :) Enjoy your time of rest and NOT writing, but I so look forward to your return here. xoxo! 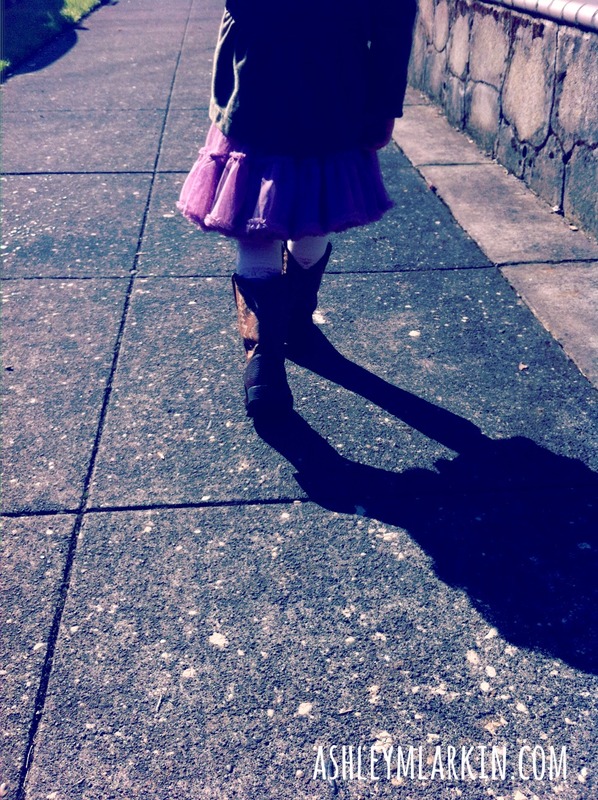 Love this final post of the 31 days…you Rock girl. AND I love the picture and Buechner quote. Thank you, Thank you my friend for showing up for us…for this past month…What a blessing to receive. You have certainly helped build into me a deep love and appreciation for Buechner, Angela. (And I couldn’t believe how apt this quote was to this 31 day journey.) It would have been so much more difficult for me without your cheering, encouraging and listening heart. I love you. *clapping* You should put your feet up and have something sweet. Great job, Ashley! Thank you, darling Tresta! Will I see you again at the Faith & Culture Writers Conference in April? I sure hope so. I will have to check into it, Ashley – would love to. It was a blessing last year and I need a shot in the arm now and then! “Sprinkle Moondust in it’s wake”! I almost coffee sprayed my monitor (while The Carpenter’s, “Close to you” played merrily in the background)! I suppose proper “Be Here Now” etiquette prohibits me from asking how you will spend your first unencumbered day, even though I’m quite sure I would not be the only reader asking. More to the point though, what are we-the readers-going to do without something that has become such a part of our daily ritual? But no worries, I won’t start the, “Slow clap” accompanied by shouts of, “Encore” for all to join in on, but instead merely tap out a heart felt, G-O-O-D- -J-O-B- -A-S-H-! it’s been fun! You are so dear, Uncle Don. ‘Twas a good rest. Enjoying everyday life with the kiddos and Mike, digging into some piles around here, taking care of life details that have been much neglected over the last month. So happy to have had you along for the October ride with me. 31 days of writing on one subject matter is quite the feat. I am sure there were several days that you wished you would of never done it. There is always something I take away from your posts, your honesty. And that is saying something. Great job girl. I need to come over here and curl up with the posts I missed and read them by the fire. I know that the days I missed would bless my socks off. Breathe deep and exhale and rest. You deserve it. Well done girl. I just long to catch up with your words, your overflow of that precious heart. Soon, I hope, So Soon. Dear Elizabeth, grateful to journey with you. A cuppa and snuggle by the fire is just the right way to curl up with YOUR words. Bless you, friend.